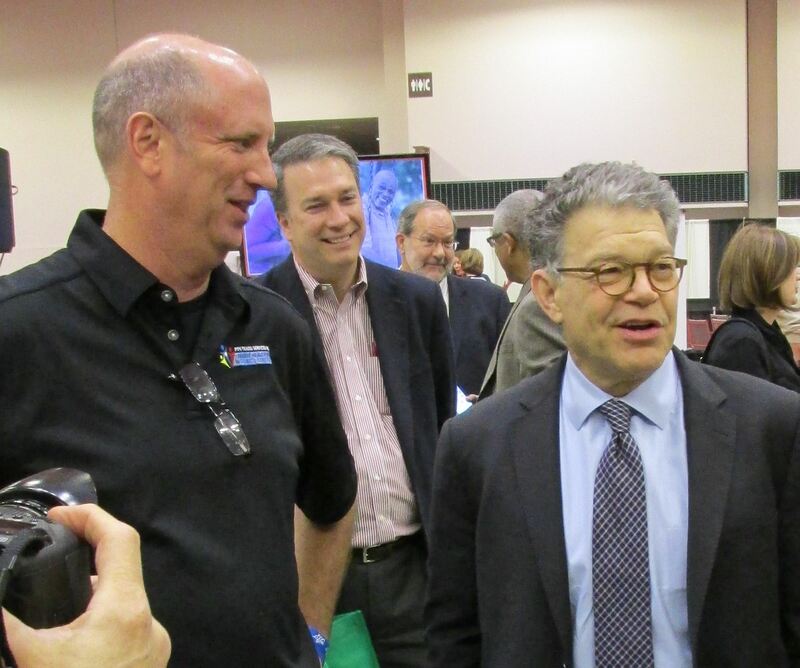 HealthWORKS, a new coalition of Taft-Hartley health and welfare funds, presented U.S. Sen. Al Franken with an award at the annual “Health and Benefit Fair” held April 26 at the Minneapolis Convention Center. The HealthWORKS Hero Award recognizes Franken’s advocacy on behalf of Taft-Hartley plans, industry-based health insurance funds that cover workers at multiple employers and are run jointly by labor and management. Taft-Hartley plans, which cover hundreds of thousands of Minnesotans, are finding the regulatory landscape difficult to navigate in the wake of the Affordable Care Act, according to James Hynes, executive administrator of Pipe Trades Services Minnesota, the local Taft-Hartley fund that founded the HealthWORKS Coalition. Franken, a DFLer from Minnesota, co-authored the Health Care Fairness and Stability Act of 2014 with GOP Sen. Mary Kirk of Illinois. It would provide relief to Taft-Hartley funds, delaying by three years the collection of a “reinsurance fee” for each member covered in their plan, as mandated by the ACA. The fee, which will come due in December if Franken’s bill does not become law, is $63 per participant in the health insurance pool. That means it falls not only on employees, but on their dependents as well. For the Minnesota Pipe Trades’ fund alone, it will amount to nearly $1 million. Where will that money go? The ACA created the “reinsurance” program to steady the cost of health care premiums by requiring insurance companies to pool together funds for emergency purposes – like when a person’s medical bills exceed the coverage levels anticipated by their insurer. Unfortunately, the ACA requires Taft-Hartley funds and businesses that are self-insured to pay the fee, regardless of whether or not they will benefit from the reinsurance program. “Essentially, it takes money from our members to put into a trust fund that insurance companies can access,” Hynes said. In addition to delaying the collection of reinsurance fees from self-insured businesses and Taft-Hartley funds by three years, Franken’s bill would seek to pinpoint the actual cost of the reinsurance program, so that a more efficient and fair funding mechanism can be established. That leadership earned Franken the HealthWORKS Hero Award. The senator accepted the award at the Health and Benefit Fair, where HealthWORKS used its presence to urge members of Taft-Hartley plans to sign onto a petition of support for the Health Care Fairness and Stability Act, and to send thank-you notes to Franken and Sen. Amy Klobuchar, a co-sponsor, for their support of the bill. HealthWORKS is quickly growing into a leading advocacy coalition for Taft-Hartley plans nationwide. The coaltion is also pushing for other amendments to the ACA, including language acknowledging the existence – and benefits – of multi-employer health funds, and relief for Taft-Hartley participants from penalties for not insuring their workers. “If the employer is signed to a collective bargaining agreement and pays into a multi-employer health fund that meets the criteria of the ACA, that’s all they should need to do,” Hynes said.